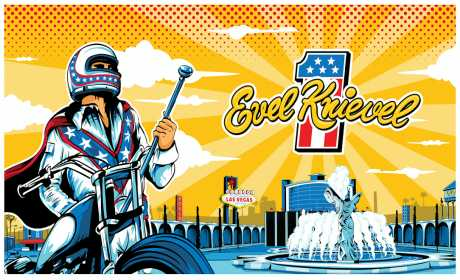 Now it’s your chance to step into the shoes of the legendary daredevil hero with the Official Evel Knievel game! 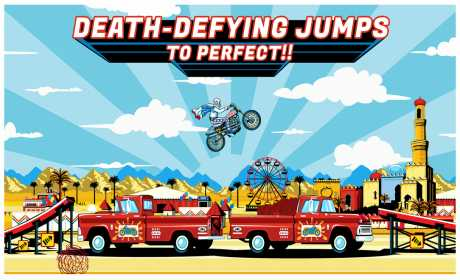 Relive his spectacular career, starting with a humble 250cc Scrambler jumping Rattlesnakes and Lions, working your way up to insane jumps like 13 London Buses and the Las Vegas Casino Fountain on the 750cc Ultimate. Have fun doing wheelies, flips, loops and many other stunts. Negotiate flaming hoops, springboards, cranes and many other exciting obstacles. Earn money from completing jumps to buy loads of fantastic bikes and outfits, including his iconic White and Blue leathers and the awesome Jet-Powered Stratocycle!